I went to Yosemite this past week to attend the Yosemite Renaissance opening at the Yosemite Museum, and ended up getting some photos I am very pleased with. Here is the link to the images on my website. Late February is a great time to get shots of the last rays of light on Horsetail Falls. I had the perfect combination of clear weather and good flow in the falls to get a great shot of this iconic image, which was taken on Feb. 28 - the following night the falls did not put on quote the same show since the sun went behind the clouds, so I felt lucky to get this image. I was pleased to have a chance to meet William Neil and Michael Frye, who both had wonderful images in the Yosemite Renaissance show - all 3 of us were next to the Merced River getting shots of horsetail falls right before the opening party started on Feb 29th. 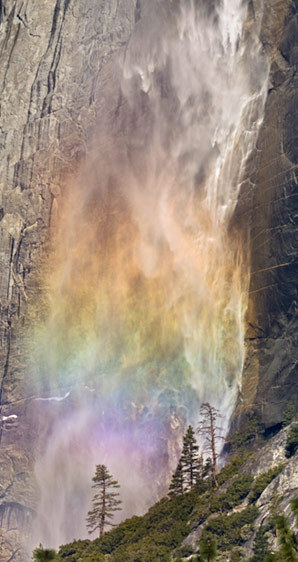 I also ended up with an amazing shot of a colored rainbow on upper yosemite falls - I was actually photographing another subject when I turned around and noticed a rainbow forming around the top of the falls. The color slowly moved down the falls as the sun rose, and near the base of the upper falls I captured this shot. It was a singularly amazing moment for me, it seemed as if the water from the falls was raining down color in vast multichrome sheets. This was taken with the Hasselblad HC 300 mm lens and 1.7 teleconverter. Absolutely awesome stuff. These images will become part of Yosemite folklore. Go Girl! Thanks for your support Tom and Randy! I appreciate the positive feedback. Really beautiful/spectacular. Can't wait to see your gallery and some of these images for real this summer.